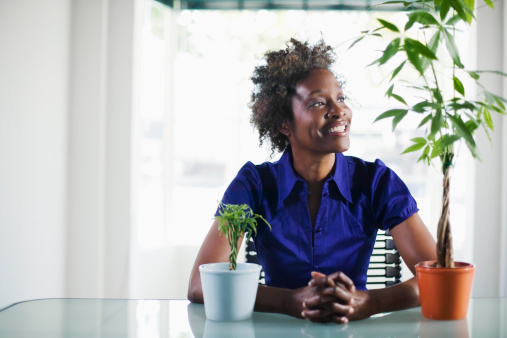 Examine your sick money tree for signs that it is being either over watered or under watered. Leaves on a money tree that are over watered become yellow and droopy, according to online bonsai nursery JoeBonsai.com. Too-dry trees exhibit leaves that are wrinkled and curled. Watering issues are the most likely culprit behind any houseplant problems, according to Purdue University Cooperative Extension, so start here first. Repot your money tree in equal parts potting soil, peat and perlite in a pot with a drainage hole to avoid having its roots sit in water if your plant shows signs of being consistently wet. Allow soil in the new pot to dry completely between waterings. Move your sick money tree plant to a location that receives bright sunlight in either the morning or late afternoon and mid-afternoon shade. Spots and blisters on leaves are signs light is too intense for the plant. Yellowing in older leaves is a sign of insufficient light, according to Ohio State University Extension. A money tree can be damaged when it is left out in the cold -- below 50 degrees Fahrenheit -- or in a spot that is too warm -- above 86 F. The preferred temperature range for a money tree is from 77 to 86 F, according to Hrovatin Exotica, an online exotic plant resource. Examine stems and leaves for specks, webbing, sticky residue, white bumps and branch dieback -- all signs of either spider mite, mealy bug or scale infestation, to which money plants are particularly susceptible. Apply rubbing alcohol to a cotton swab and dab it on the small bumps -- scale insects -- on the stems of your money tree if it is lightly infested. Use a spray with the active ingredient pyrethrin, a plant-derived insecticide, on plants with larger infestations. The spray works on mealy bugs as well.